I have chauffeured a few important people in my life in this community. I had the honour of being George Canyon's driver for the day, for instance, and there have been others. And just recently I have been driving the Prime Minister around to attend to official duties, not for security but mainly because she can't drive yet. Yes, I said she, and that she can't drive yet, because the Prime Minister I am driving is the Intrepid Junior Blogger, as she takes care of her tasks for her role as student council prime minister. And I must say it is an honour to be her chauffeur, as I am learning so much from the experience. One weekend morning a couple of weeks ago it was bitterly cold outside, and snowing like mad. I looked outside and sighed, because the IJB had told me the night before that she had to attend a football game for the school. My jaw dropped a bit when she told me, as she has never before expressed interest in going to a game, but when I questioned it I was given a steely look and an explanation of what it means to be a school representative and how it means attending school functions even if you don't understand the game played. And so we went, wrapped in blankets and sipping hot drinks and covered in fresh snow and still leaving at half-time when we couldn't feel our feet. I sat there and thought about how these school football games haven't changed, even from when I was in high school, and it took me back to all those days when I sat on cold metal bleachers and watched a game I barely understood, simply because I was the yearbook editor. Then last week she came home and told me she had a role in the annual Santa Claus parade. She explained that her school had been asked to provide students to "Stuff the Bus" for the Wood Buffalo Food Bank, and it was clear she must attend as prime minister - and because the food bank is a cause close to our hearts. And so I drove her down to the food bank and dropped her off, headed to my own event and keeping a close eye on my phone as her texts began rolling in. "We got the party bus!" one said, and "This is awesome". Then the texts stopped, right until a very kind friend went to pick her up and deliver her to me at the event I was at, because we had to arrange another chauffeur for the prime minster that night. She got into my car as we left my event and began telling me about the night - how generous everyone was, and how she had proudly walked the entire parade route wearing her Doctor Who Tardis hat and collecting donations. She told me how they had stuffed the bus, and how she was amazed at how many people would hand over twenty dollar bills for the cause. And she told me how proud she was to have done it, not because it was her job as prime minister to be there, but because she believes in the food bank and what they do. All the while her small hands were waving in the air, clad in bright white mittens - mittens that she had not left the house with. 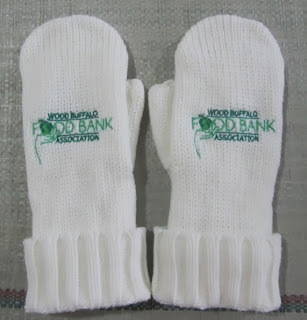 I asked her where they had come from and she quickly showed me that they were Food Bank mittens, and that they had been given to the volunteers that night. She has worn those mittens every day since then. She lost her wallet on the bus yesterday, but she was relieved she didn't lose her phone...or her mittens. She takes a great deal of pride in them, and what they mean, and I take a great deal of pride in her, my little prime minister. Last night I was saying I needed to get a pair of those mittens, and once again I was fixed with that steely expression. 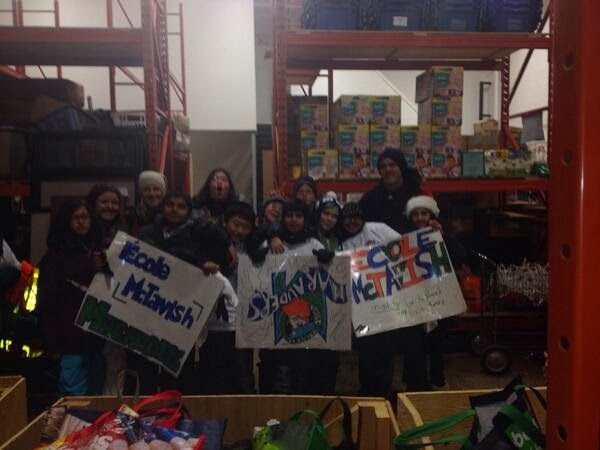 "When was the last time YOU volunteered at the food bank, Mom? ", she asked. And that is when I realized that the prime minister understands what it means to be a citizen, and a part of this community, and how we all have our role to play, including student council prime ministers. So you see this holiday season I plan to go into the food bank to sort food, because I haven't been there for awhile and I think I need to reconnect with that part of my spirit. And, well, because lately I have been driving the prime minister, and I have learned a few things on our many travels together.